Persistent reports of grave human rights abuses in Cameroon — including a widely shared video showing the alleged execution of a woman, child and baby — must be investigated by the authorities urgently, UN rights chief Zeid Ra’ad Al Hussein said on Wednesday. Amid a backdrop of protests in the English-speaking north-west and south-west regions of the West African country that escalated in late 2017 into clashes between State military forces and armed groups, Zeid condemned an ambush on a Government convoy that took place earlier this month. But he cautioned that the Government’s “heavy-handed response…will only make matters worse for the women, children and men caught in the middle”. 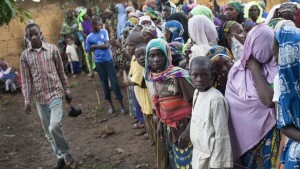 To date, the violence has forced more than 21,000 people to flee to neighboring countries, according to UN humanitarian staff, while 160,000 have been internally displaced, many reportedly hiding in forests to protect themselves. To prevent the situation from deteriorating further, Zeid urged the Government to launch independent investigations into alleged violations by State security forces and abuses by armed elements. In a statement, the High Commissioner also noted serious violations in the far north of the country, where the authorities continue to confront the terrorist group Boko Haram. Zeid said that he was “utterly appalled” by a video reportedly showing members of State armed forces executing a woman, a child and a baby who were accused of belonging to the separatist militants, and insisted the Government had an obligation to investigate the crime. “I am deeply worried that these killings captured on camera may not be isolated cases,” he said. Given the seriousness of the reported violence by State and armed actors, the UN official added that it was “regrettable” that the Government had failed to grant the UN Human Rights Office (OHCHR) access, despite repeated requests. “We will now need to explore other options, including remote monitoring,” Zeid noted. Posted by Geraldine Boechat on July 26, 2018. Filed under News. You can follow any responses to this entry through the RSS 2.0. Both comments and pings are currently closed.